What are Organic Traffic KPIs? Organic traffic KPIs, or key performance indicators, are metrics used by marketing teams to measure and track the effectiveness of their content and SEO efforts. They inform content and SEO strategy and can even provide insights into brand awareness for product marketers. While content teams typically rely on organic traffic KPIs to inform them on what content is attracting the types of audience that convert, SEO teams rely on these KPIs to find weaknesses and optimization opportunities in their SEO strategies. How do I choose the right Organic Traffic KPIs? The first step to choosing your organic traffic KPIs is determining your company objectives, then you can create KPIs that support those business goals. Typically, organic traffic KPIs are tied to customer acquisition and brand awareness objectives, as it is well known that organic traffic typically converts at a higher rate than paid traffic, which means your organic traffic performance can heavily impact your sales pipeline. An example of this may be if your company is looking to boost revenue, an organic traffic KPI may then be reaching a certain percentage of revenue contribution. You may start by taking a closer look at your bounce rate and top bounce pages to see when and where people are leaving your site and then optimize those pages as needed. Or, if your company is attempting to pivot your messaging to enter a new market, you may set a few KPIs for keyword rankings on new terms associated with that messaging and conversions on those terms. It’s important to remember that when it comes to KPIs, there’s no “one-size-fits-all strategy.” You should be able to custom tailor the data that is right for your specific goals, and keep in mind that those metrics may continue to evolve along with your company. While digital marketing KPIs often relate to lead and revenue goals, digital marketing strategies are often fueled by organic traffic metrics. As a PPC manager for instance, you may be looking for which landing pages and keywords are bringing in the highest quality leads. A great place to look for building your next campaign is where your organic traffic is landing on your site and whether or not they are staying or bouncing. This can help you optimize messaging and retargeting campaigns to move marketing leads down your funnel. As an email marketer on the other hand, you may want to take a look at not only the landing pages that folks are responding to, but also which downloadable pieces are performing the best from an organic standpoint. This may help you find a lever or piece that can give you—and your sales team—an extra boost exactly when you need it. If you’re a PR manager, you’re searching for the next big way to get your company’s name out there, or making sure it stays popular. Organic traffic KPIs surrounding brand awareness and branded searches can help you measure the success and prove the ROI of your PR campaigns. It’s no secret that SEO is a long, holistic game with a variety of factors contributing to success. Organic traffic is typically the north star metric for whether or not your SEO strategies are succeeding, but taking a deeper dive into these metrics can help SEO specialists spot optimization opportunities that can help them inch closer towards success. One of the most important metrics a SEO manager can use is average session length. When visitors spend only a short amount of time on your site, a search engine will track that and note the result wasn’t what the visitor wanted, which can damage your rankings in later searches. Of course, bounce rate is another metric that comes into play here. If a visitor leaves after just one page, a search engine is sure to conclude that your site wasn’t an effective search result. It’s simple: the more time organic visitors spend on your site (and the more pages they visit), the higher you’ll be ranked in searches. Comparing high time-on-page and low-bounce pages with low time-on-page and high-bounce pages can help determine whether it’s time to retire certain content or revamp it with great design, more engaging content, and effective calls to action. from. Referring domains are an important piece of any SEO strategy, and tracking whether or not those domains are sending you traffic that actually want to engage with your site is an important piece of the puzzle. 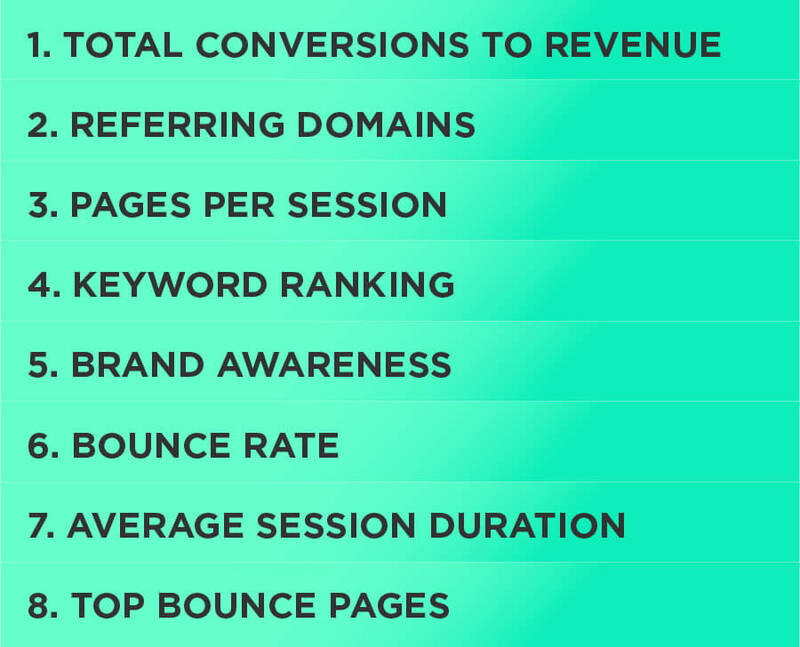 Lastly, total conversions to revenue are also a good indicator for your SEO efforts. After all, the ultimate goal of organic traffic is to make money. Lack of conversions may encourage you to take a closer look at your meta tags and descriptions, page layouts, and even something as simple as your CTAs. Studies show that you only have 3 seconds on average to convince someone to stay on your site, so keeping it operating at peak performance is crucial for converting organic traffic. KPIs like bounce rate and session length are essential for helping you identify potential problems. For example, if your bounce rate is high on a specific page, you should take the time to segment your bounce rate data across different browsers and devices to make sure there’s not an accessibility issue. If you find that your average session length is always short, regardless of the landing page, it may be due to a lack of calls to action. Organic traffic KPIs can also help you to determine the effectiveness of your website’s overall navigation. Good website navigation obviously makes it easier for your visitors to find what they want (leading to longer session lengths and increased conversion), but it can also make it easier for search engines to crawl—ultimately helping customers to actually find you. KPIs can help you find any issues with your navigation experience and provide you with insight on how to fix them. For a quick reference to these KPI examples, download our Organic Traffic KPIs Cheat Sheet. Total conversions to revenuetells you how often your visitors are doing something you want them to do (i.e. make a purchase, fill out a form, etc.). Keep in mind how your number of visitors impacts your conversion rate. For example, if your site is getting thousands of unique visits every week, expect a smaller conversion rate. Referring domains are domains that host links to your site. The easiest way to find backlinks to your own site is by using the Referral Traffic section on the Acquisition tab in Google Analytics. You can then export this data to take a closer look at the quality of these links. You’ll probably want to focus on the conversions you obtain from these links, the referring domain’s spam score and whether or not it’s violating Google’s guidelines. From there, you should be able to crunch the numbers and determine how many of your referring domains are “good” and develop a strategy for how you can get more like them. Pages per session refers to the average number of pages viewed during a session on your website. You can find this information by logging into Google Analytics, going to the Audience tab, and clicking overview. The ideal pages-per-session number is dependent on how many pages are on your site and what your goals are, but is usually considered to be two or more. However, if you suspect your number may be abnormally low, you may want to consider implementing stronger content and more calls to action. Keyword ranking is where your site is ranked in search engines for a keyword and it has a huge impact on how people are able to find your site organically. And since research shows that the majority of clicked links are the top result on a search engine, you need to make sure you’re at least showing up on the first page. To figure out your keyword ranking, you’ll probably want to use the Acquisition page on Google Analytics to see what people searched to find you, and how effective those keywords are. This tool will show you your average keyword ranking position, over all your website URLs and all keyword queries. Of course, the ranking itself isn’t everything, so you’ll also want to pay attention to how many times those keywords led to actual clicks. 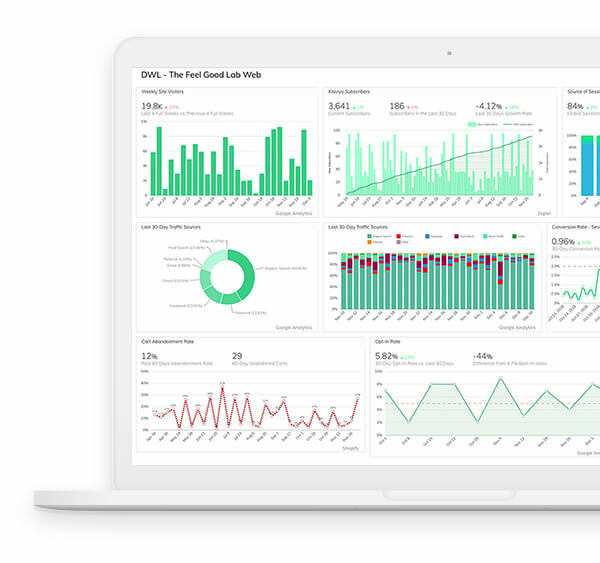 Formula: Run surveys, find out how often you’re mentioned online, and use Google Trends to check how many times your brand is searched. Dictionary.com sums up brand awareness as, “the extent to which consumers are familiar with the distinctive qualities or image of a particular brand of goods or services.” Obviously, this can be somewhat tricky to measure effectively, but it is an integral part of the overall success of your company. To get a clearer idea of the level of your brand’s awareness, you can run surveys, find out how often you’re mentioned online, and use Google Trends to check how many times your brand is searched. The easiest way to interpret this data is to set benchmarks to ensure you’re continually increasing in brand awareness. If your numbers go down instead of up, it’s likely that you’re falling off the radar of your prospects. Your bounce rate is how many people leave your website before browsing more than the landing page. You’ll be able to find this number easily under the Audience tab of Google Analytics. The average bounce rate is around 50%, but anything over 70% may mean that you want to take a closer look at your content and site design. Average session duration refers to how long people are staying on your site. This data is available in Google Analytics and is calculated by dividing the duration of each session during the date range you specify by the total number of sessions. Keep in mind that the average session duration resulting from an organic search is often significantly shorter than that resulting from direct traffic. That’s totally normal, but should provide you with sufficient motivation to make sure your content is as engaging as possible. Your top bounce pages are the pages most likely to encourage a visitor to navigate away from your site. You can evaluate this data in by checking your bounce rate in Google Analytics, then segmenting it by a variety of different demographics, like device, browser, and location. This will help you better understand if the bounce is a result of incompatible viewing, irrelevancy, or simply bad (or boring) content.